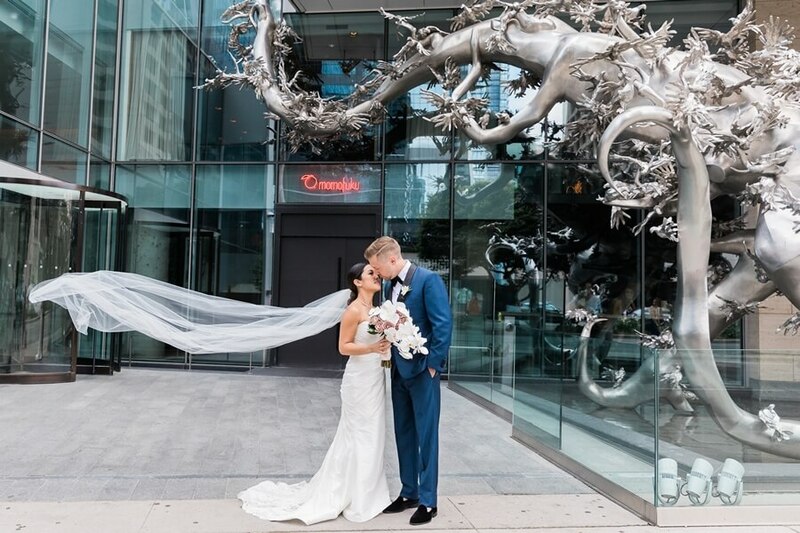 Talk about a modern couple! 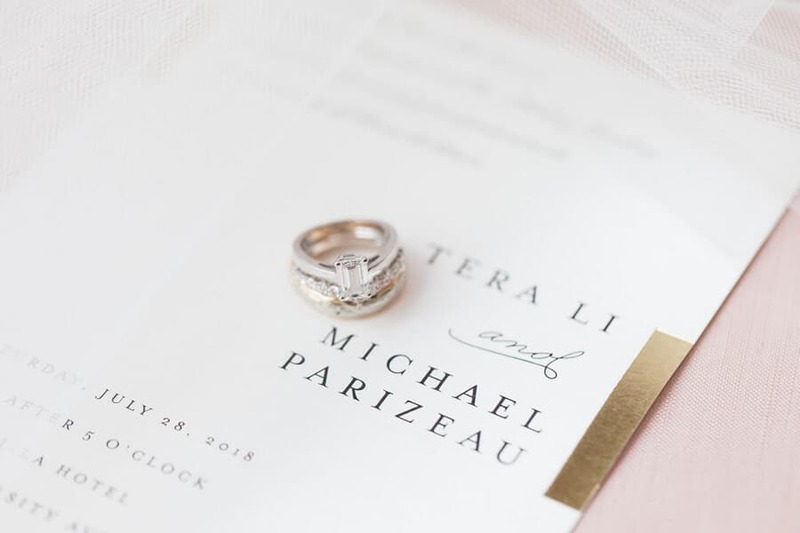 Tera and Michael met on Tinder and despite Michael showing up wearing sweats on their first date, Tera felt so comfortable with Michael that she didn’t mind the casual attire and the rest, as they say, is history! 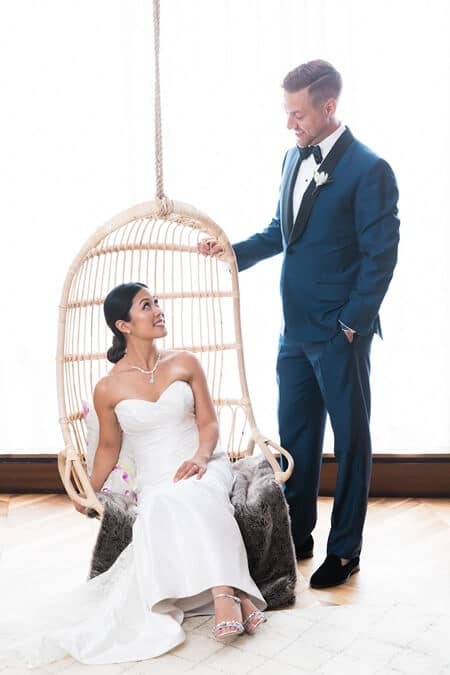 Fast forward a few years and this couple’s wedding is everything you would expect from a young, sophisticated couple. 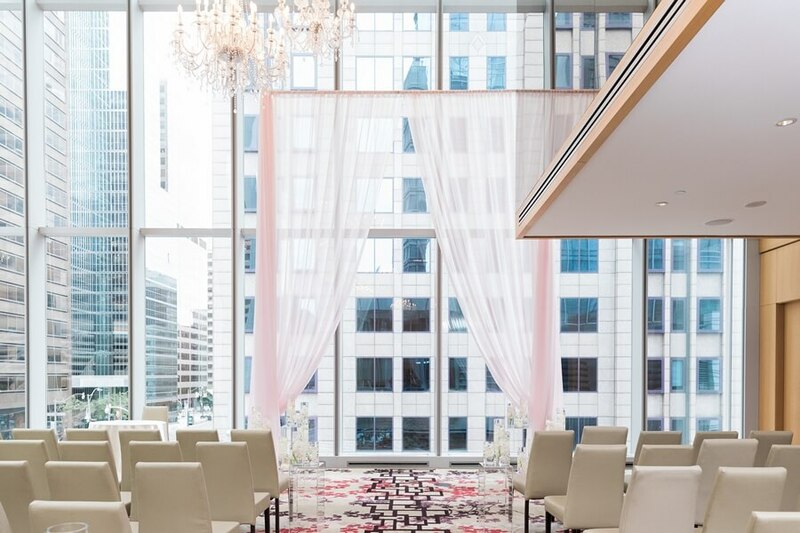 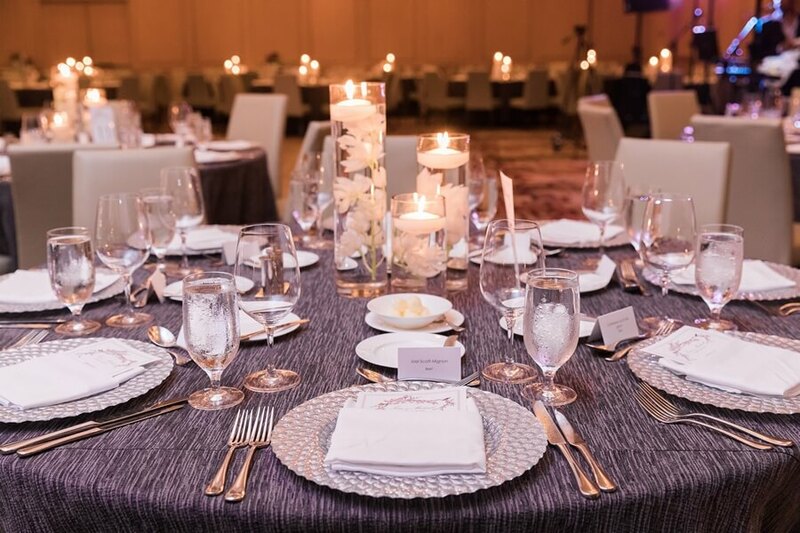 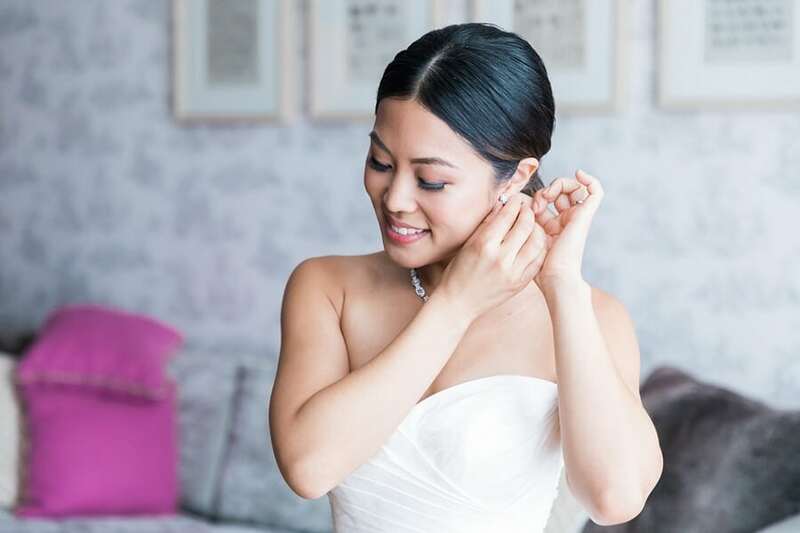 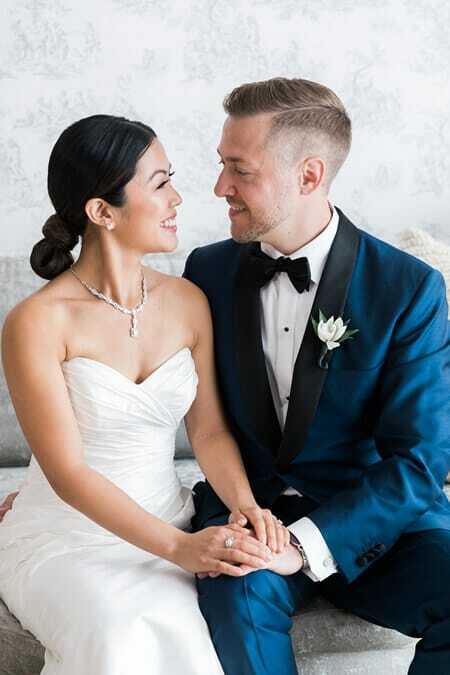 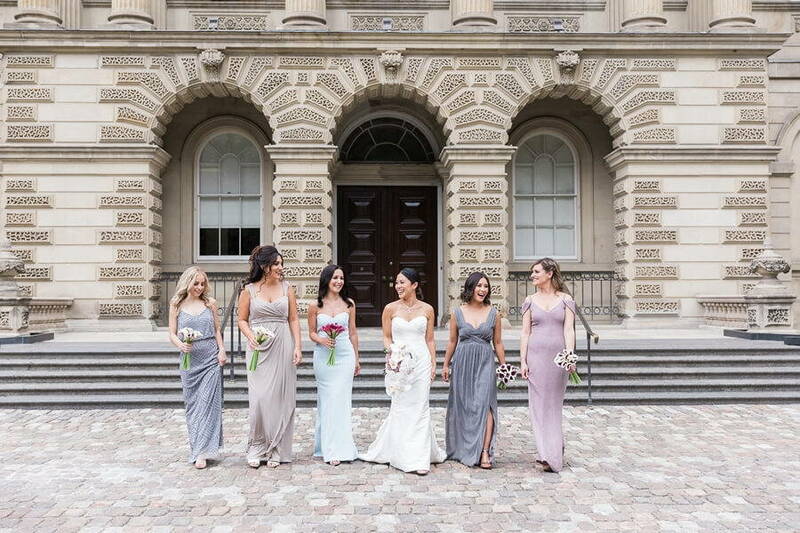 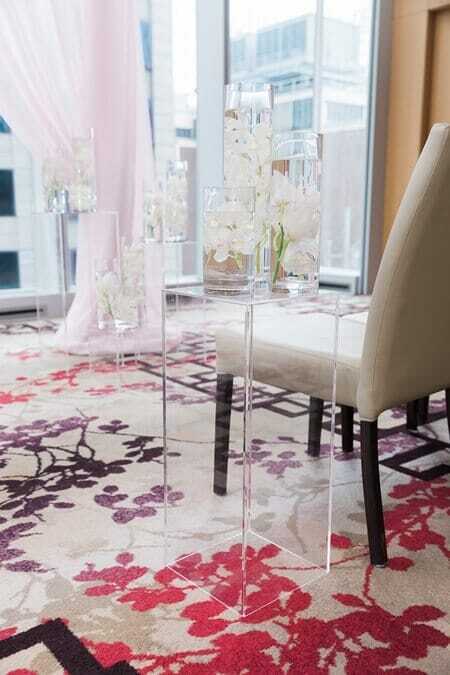 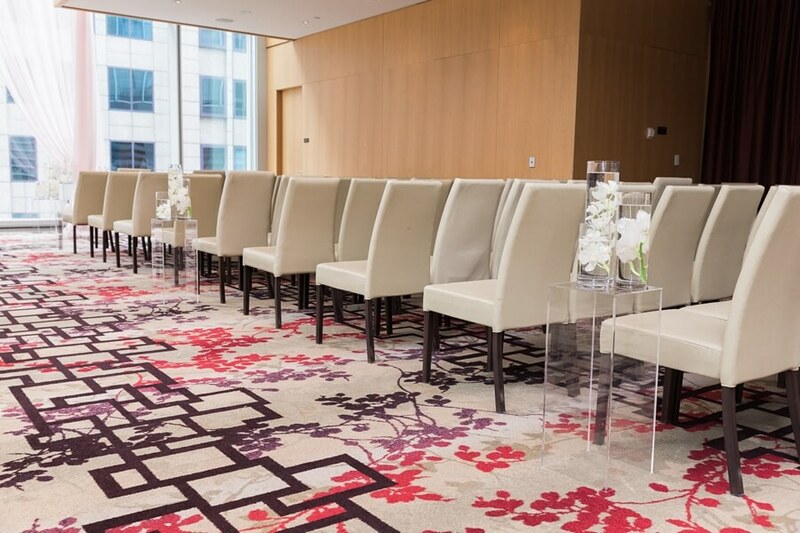 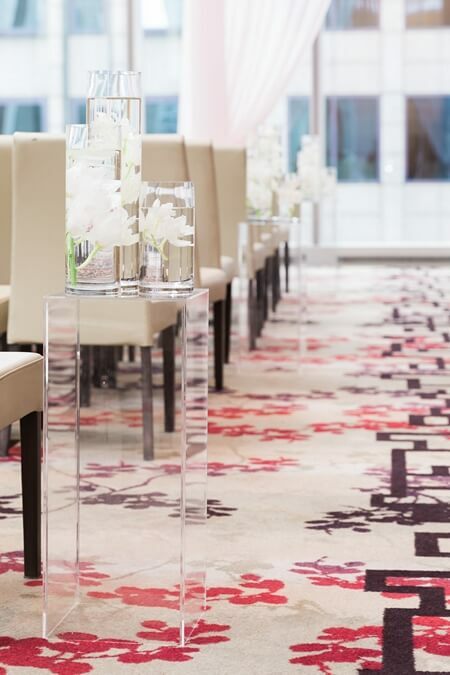 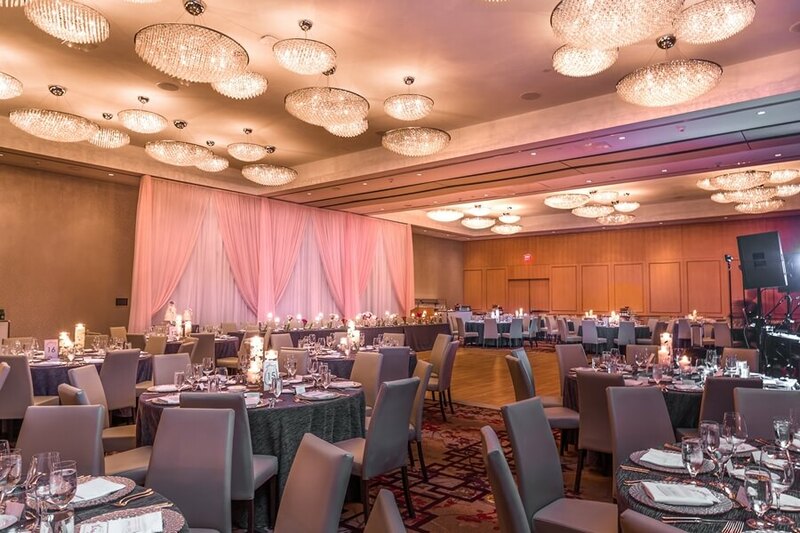 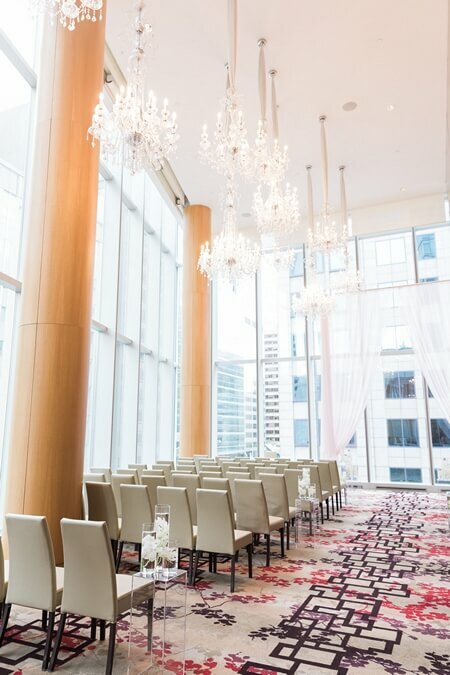 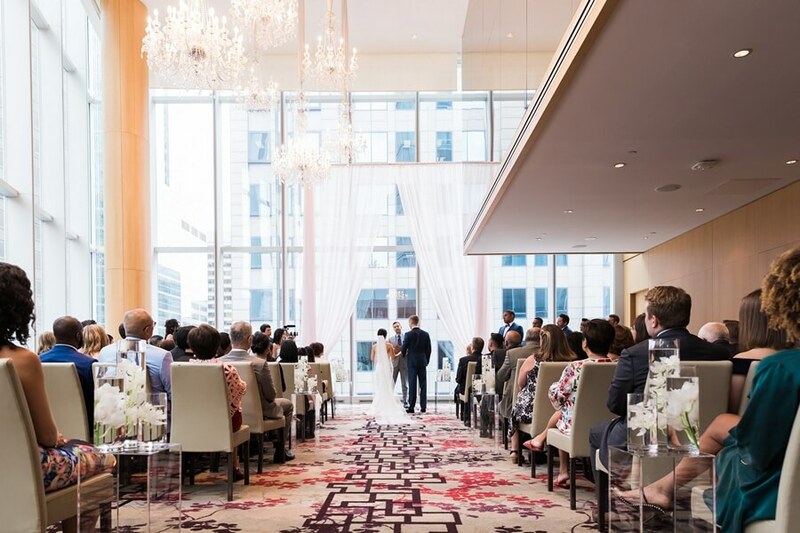 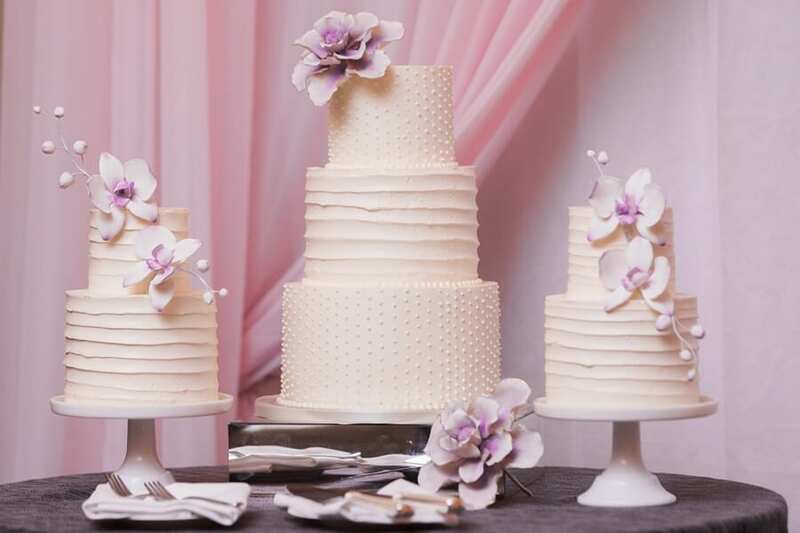 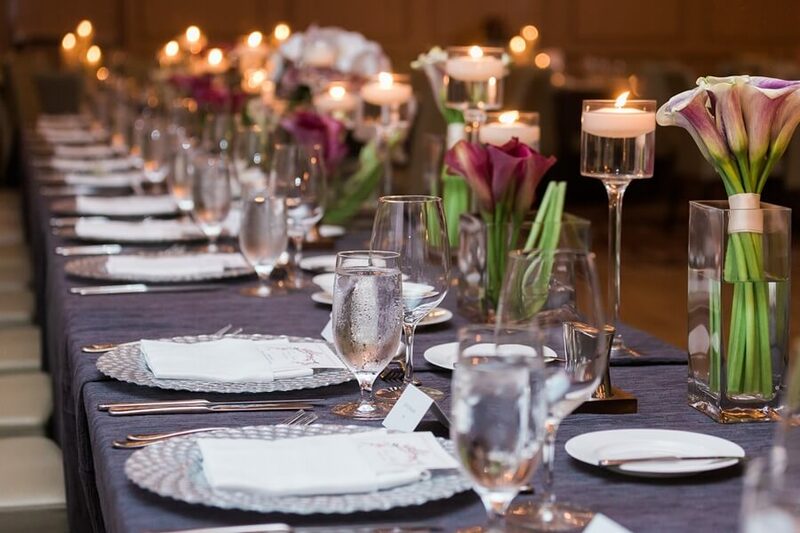 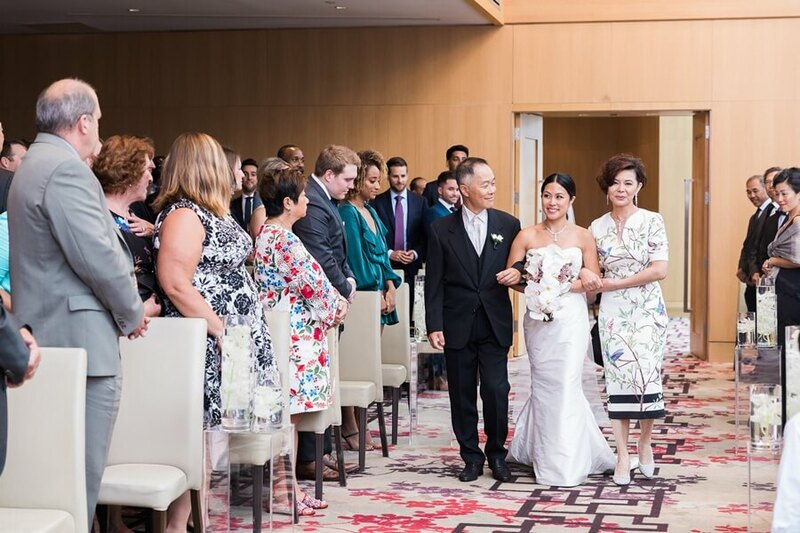 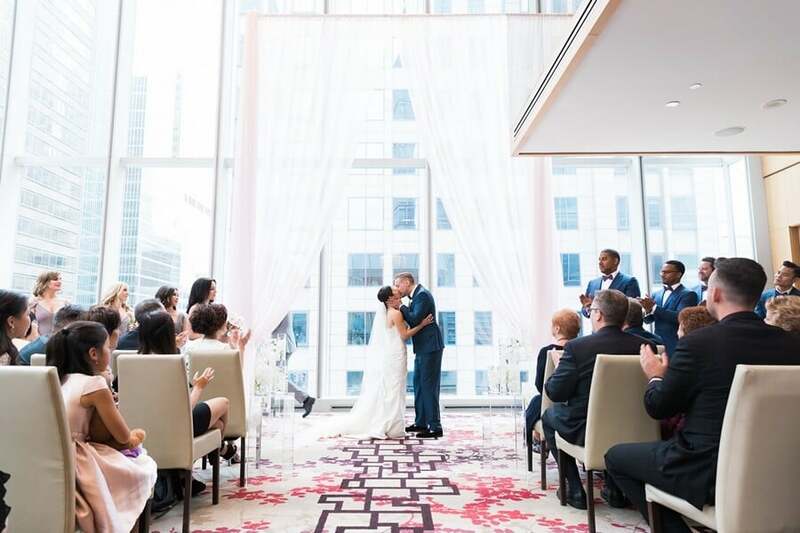 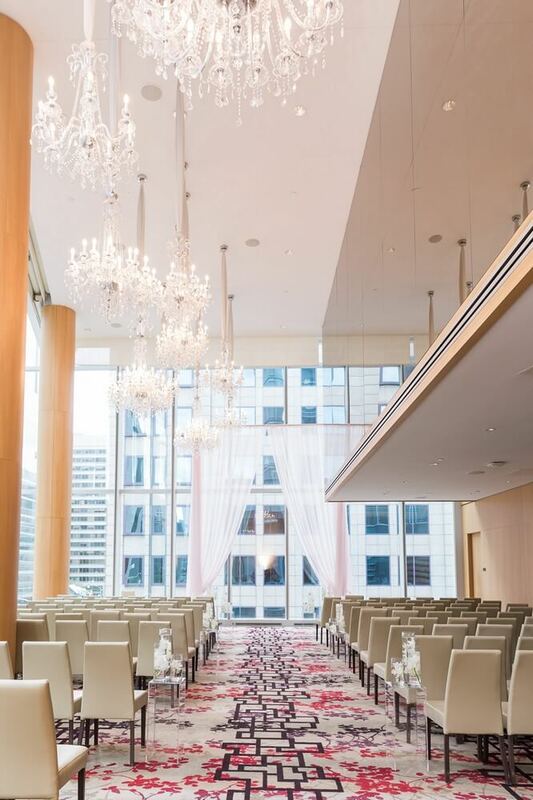 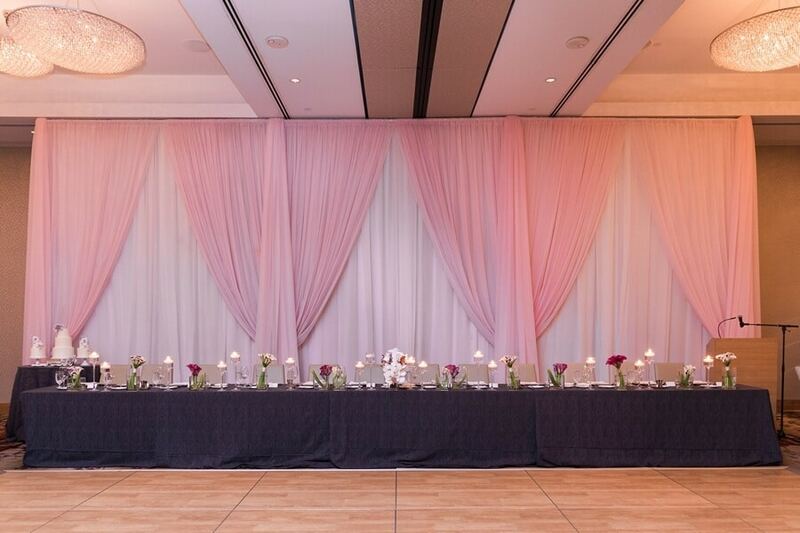 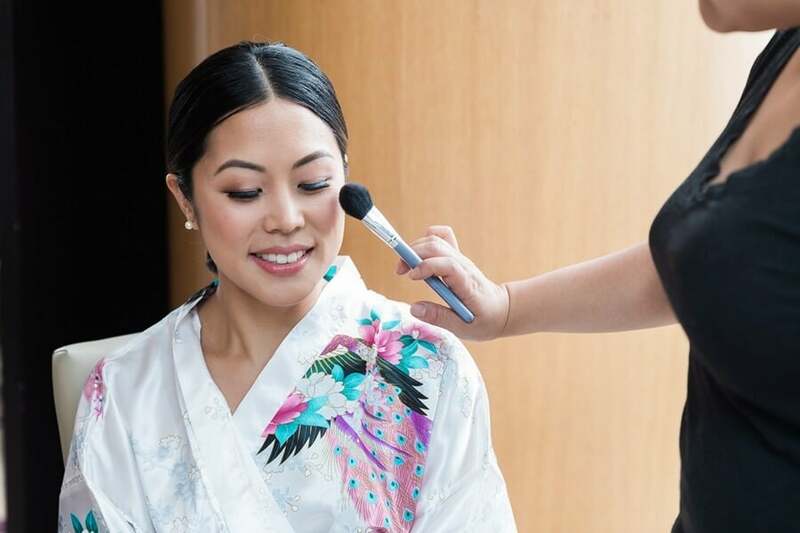 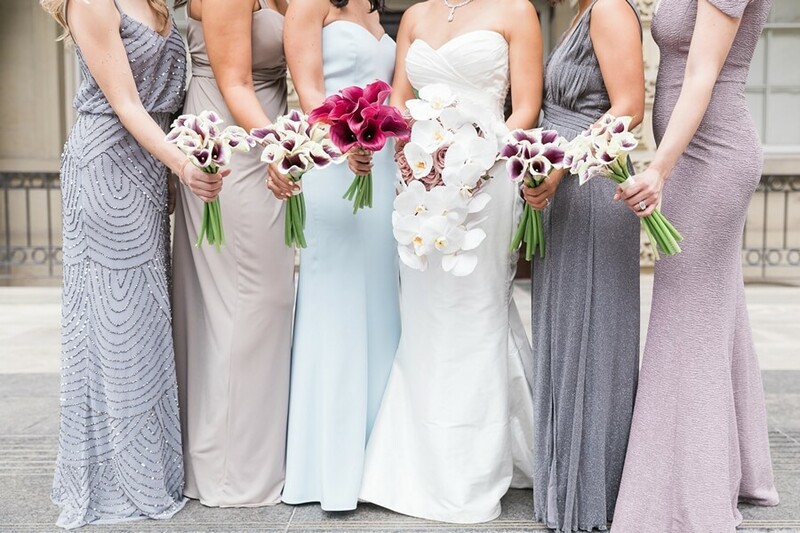 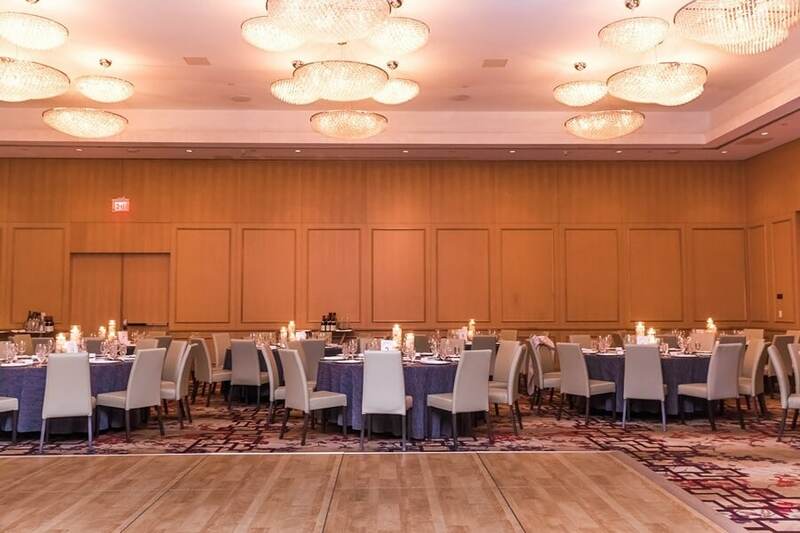 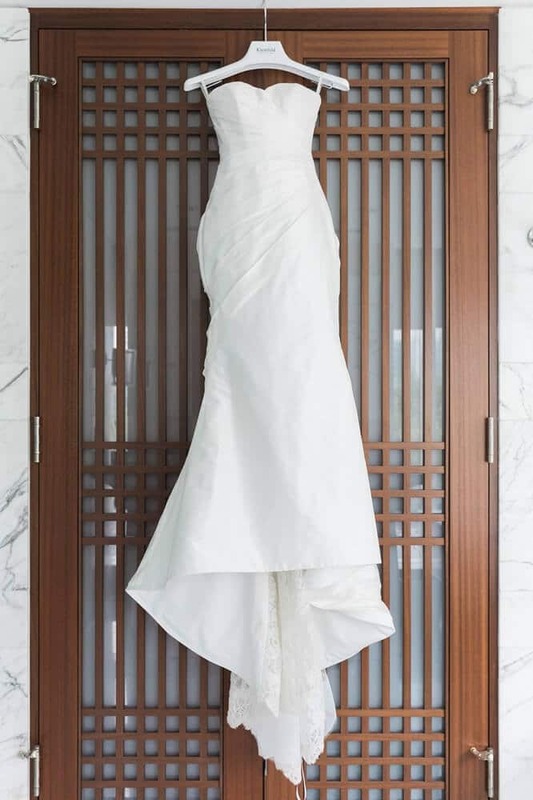 With the help of Swoon Events, their wedding at Toronto’s luxurious Shangri-La Hotel, Toronto is a perfect example of minimalist elegance: clean lines, orchids, and just a touch of colour all came together to create a beautiful atmosphere. 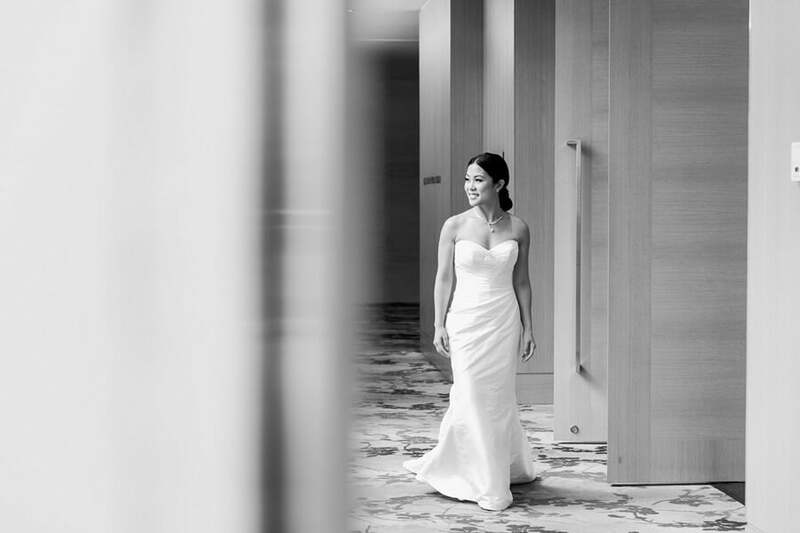 Lucky for us, Samantha Ong Photography was there to capture all the beautiful moments. 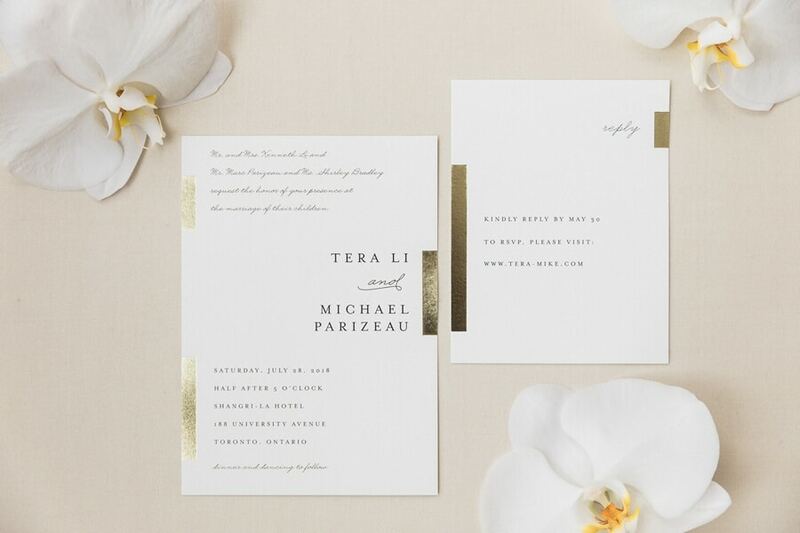 Tera’s style is truly one-of-a-kind. 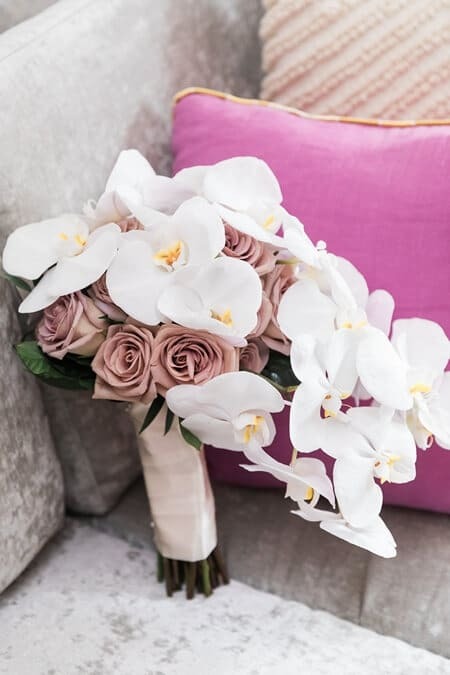 She wore a sleek Romona Keveza satin bridal dress and her unique bouquet was a combination of orchids and roses. 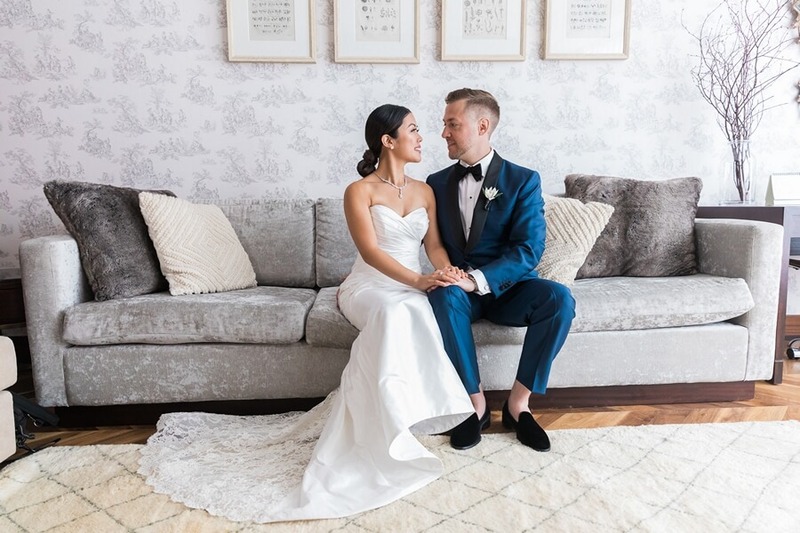 Their sweet photo session saw the couple dazzling the plush couches and grand halls of the Shangri-La. 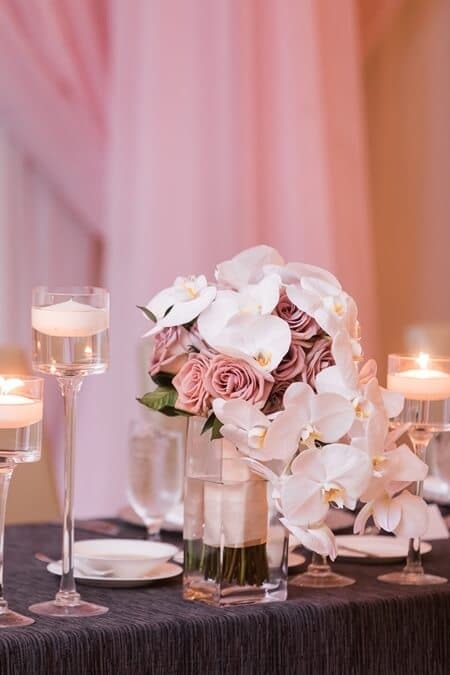 The couple stood in front of a pink drapery arch surrounded by floating orchids as they recited their vows and exchanged rings. 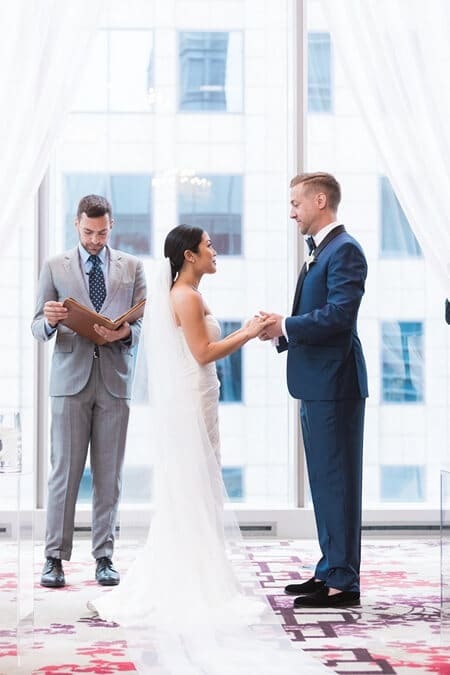 Jonny Belinko Wedding Officiant conducted the ceremony in the hotel’s lavish Museum Room, a space lined with windows from floor to ceiling and magnificent chandeliers. 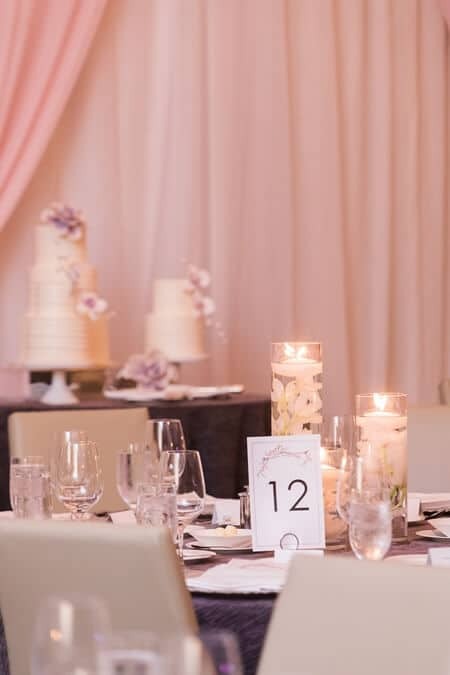 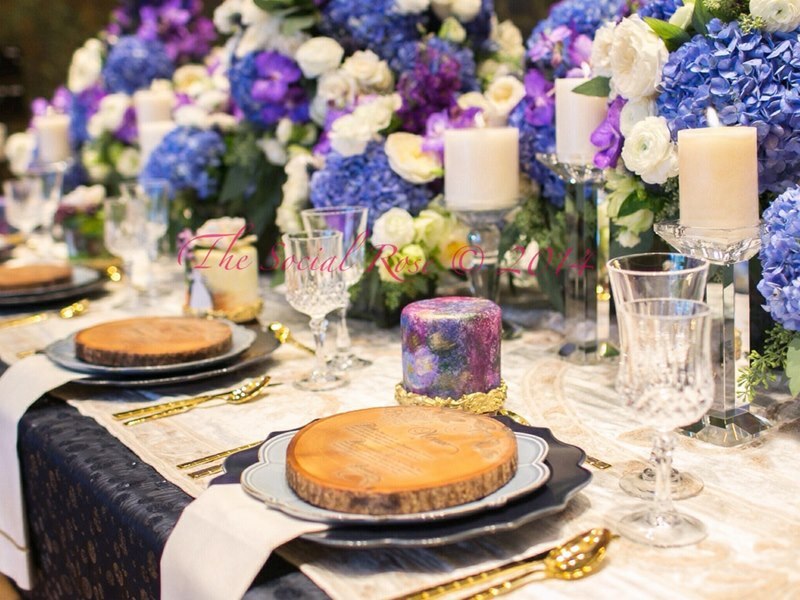 The Queen’s Park Ballroom was adorned with pink and violet hues, accented by dainty florals designed by The Social Rose. 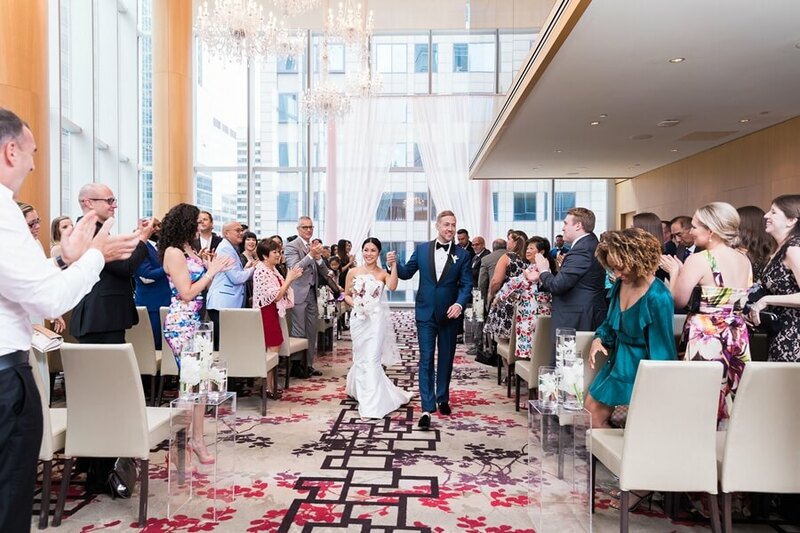 Guests filled the reception hall and danced to the tunes of the Truly Band. 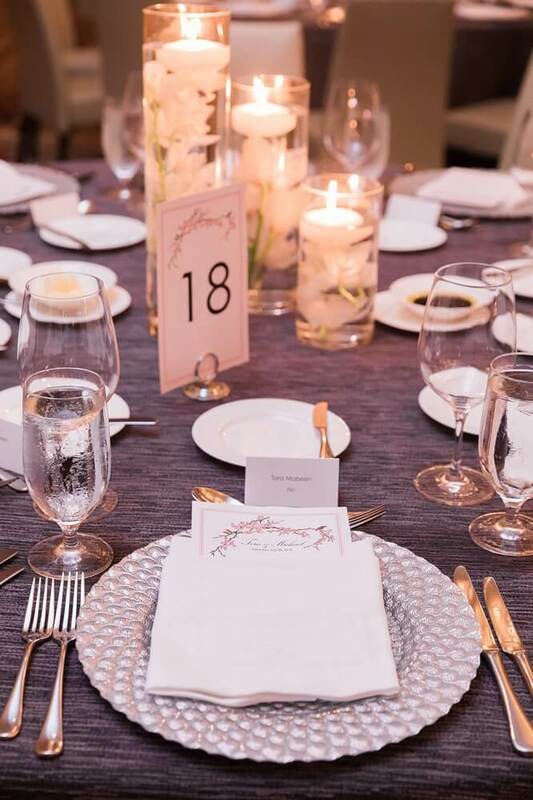 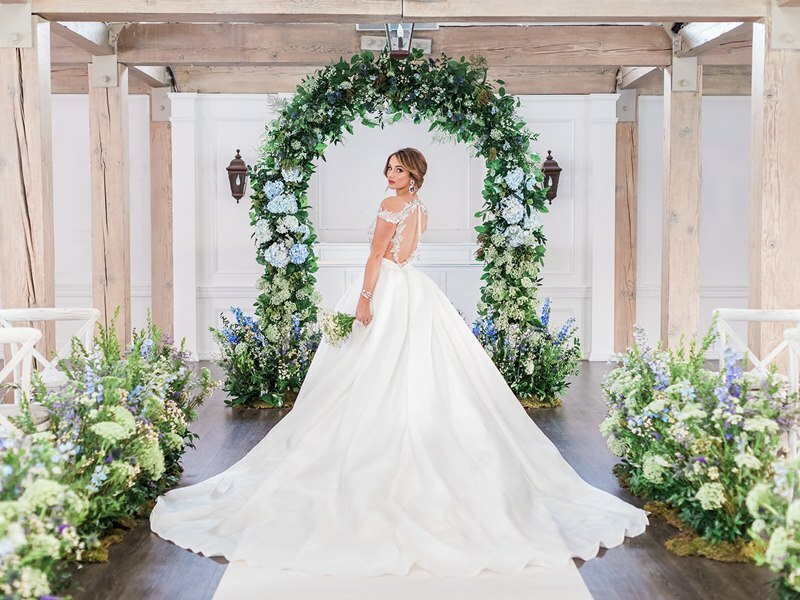 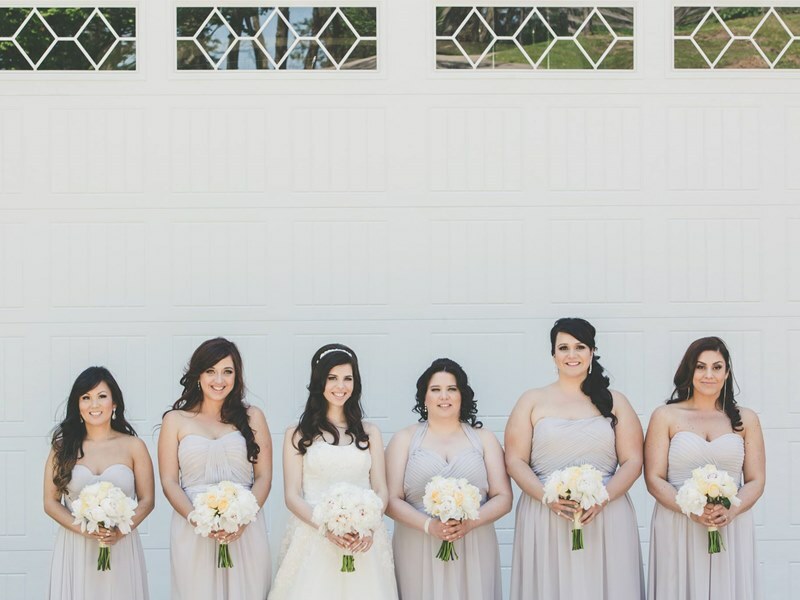 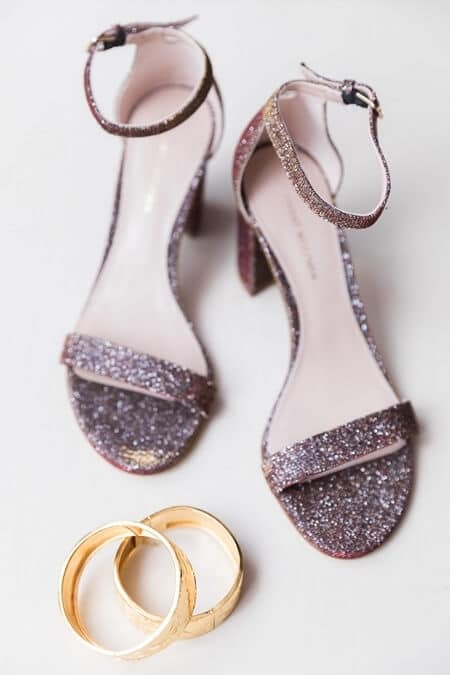 The stunning couple and the chic details made the wedding an absolutely extraordinary event, if we do say so ourselves! 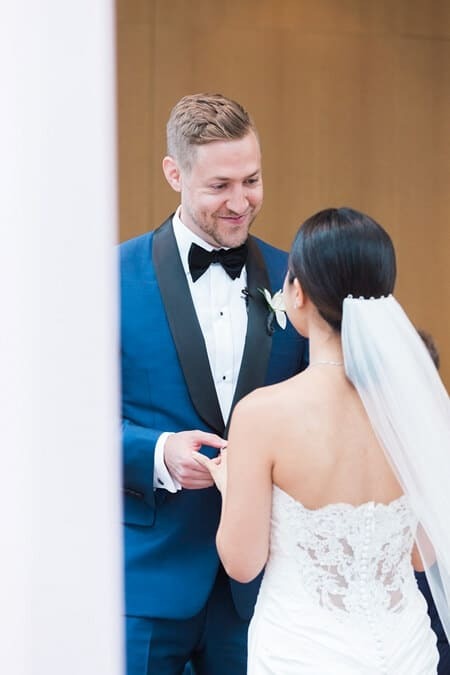 From the Bride: The first dance was one of my favourite parts of the day! 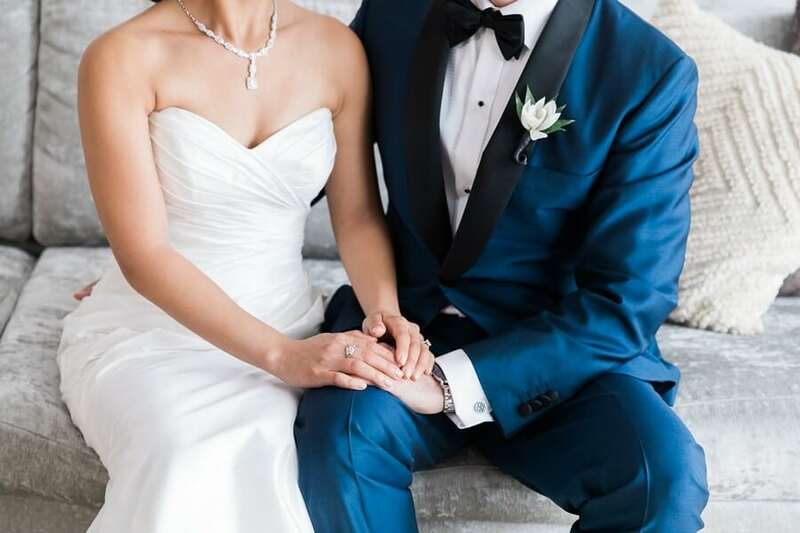 Our wedding song was Perfect Symphony by Ed Sheeran and Andrea Bocelli. 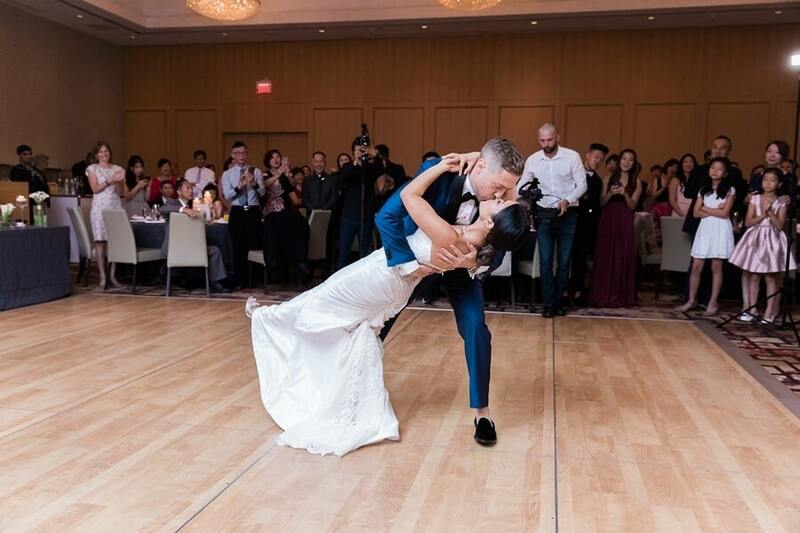 We had a choreographed dance and countless hours were spent practicing, and so when we finally had the chance to do our dance in front of our family and friends it was such an overwhelming and awesome feeling!